HAPPY New Year! On Lancashire's Fylde coast we awoke to blustery rain. Even our resident robin was cowering in the great ivy hedge at Edmonds Towers. But I'm happy to be here in Great Marton, just two miles inland as the seagull flies from Europe's 'premier resort'. Travels and jobs took me round the world, but I wouldn't thank you to be waking in an impersonal city suburb or embattled expatriate enclave. My native north of England is verdant and welcoming while, in much mocked Blackpool, there's more enjoyment to be had than elsewhere. We have a varied coast full of activities; nearby countryside; motorway, rail and air links, and the Lakes and Welsh mountains in view. While, of course, there is also my lifestyle coach, personal health consultant and closest companion - She Who Knows. How could I complain? I have even survived my Christmas gaffe of buying my wife not the luxury bath gel I intended but a cream "for cellulite and orange peel skin". Fortunately, peace and joy still reign at Edmonds Towers. Even the tinsel and other decorations will remain till next month. "The Queen keeps up her decorations until February," explains She Who Knows to those who don't. Yes, all in all, "I'm good", as they so irritatingly say these days. Of course, what each of us hopes for from life varies - or so it may seem. 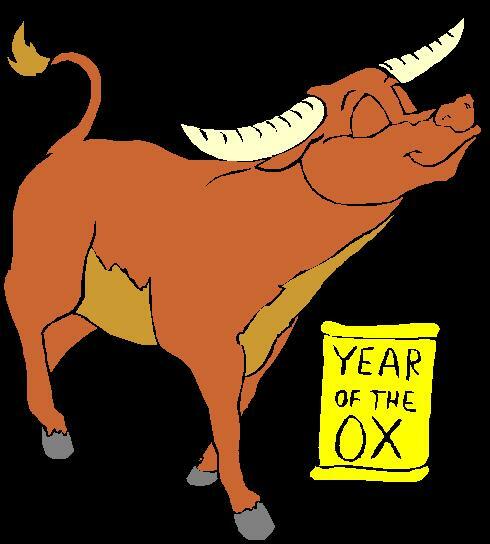 Although fearsome when roused, the strong and stubborn ox is essentially a docile beast. In Vietnam my sign is the Buffalo. I travelled that beautiful but ravaged country with a tennis coach friend. He was a good looking, easy going type (the Pig was his sign). "Life just sort of happens," he would say, "I let it come to me." I could understand and even envy that, having seen how women looked at him. But yours truly had to work harder to get by. Landing at Hanoi airport, surrounded by rice paddies, we saw a girl leading a water buffalo by the nose after its muddy toil in the fields. As for my nature and approach to life, I rather empathised with that lumbering, placid beast. A mutual friend of the coach and mine was more driven - and wealthy. "I couldn't retire comfortably," he was wont to say, "without at least a million stashed away." Tragically, they are both gone now: one too early to age gracefully; the other too late to enjoy hard-earned profits. So, we should learn to appreciate what we have now. Let's strive, yes, but also enjoy life day by day. A harsh wind of change has blown throughout 2011. The pundits now predict Britain's economy will soon be the strongest in Europe but, in the meantime, 2012 will remain hard going. We are still in our long tunnel, or should that be Chunnel? Speaking as a plodding but determined ox, it's not so bad being in a dark tunnel if heading towards light - rather than a dead end. Of course, life doesn't run as straight as most tunnels. Mine was certainly more circuitous. Money or status had less to do with my motivation than being where and with those I enjoyed. I was driven more by sentiment - or love, if you like. Ironically, what I was searching for turned out to have been waiting there all the time - back home. As many of us resolve to change or try harder in 2012, it's worth remembering another of life's ironies. You are never as joyful - or fulfilled - as when you forget yourself. So, it's best hoof forwards - towards that light! Yes, I agree - life's better savoured day by day. What's more, your entertaining blog helps me forget myself! Keep writing, please.